Shop Dean Markley 2698 SR2000 Will Lee Bass Guitar Strings 6-String from AMS and enjoy Fast & Free Shipping. Dean Markley Will Lee SR2000 Bass Strings deliver versatility and durability. These are the qualities that Will Lee, world famous bassist on the Late Night Show with David Letterman, demands from his strings. As today's most sought after session bassist, Will is constantly called upon to play many different styles of music. To do this, night after night, Will needs his strings gauged to sound and feel right, whether he's playing the heaviest funk groove or a quiet ballad. Working together, Will Lee and Dean Markley have formulated a string set designed to meet the demands of both studio and live applications. As a diminutive female, I've often had to overcome stereotypes about bass players. Seems that when people think of bass guitar, they think big. I guess it makes sense, in a way - bigger people probably have an easier time playing a bigger instrument. But I’ve gotten used to the comments. It no longer bothers me when someone says if I wanted to play a four-stringed instrument, a ukulele would be a better fit. These comments stop when I’m playing, you see. There's nothing small about my sound. When I lay down a groove, I feel bigger than a Greek goddess. Someone once told me that my bass sounded like a 9-foot grand piano. I just smiled and nodded my head. A lot easier to carry, too. Lugging that piano around was starting to hurt my back. I think it took him a second to realize I was joking, and then the absurdity of it made him laugh. Still, it's amazing how someone so little can get such a big sound. Like I said, I'm used to it. I'll let you in on a little secret, I say a confiding tone. He leans toward me expectantly. I point to the strings, Dean Markley SR2000's. Taper-wrapping at the bridge allows them to vibrate more freely. He looks crestfallen, as if he expected to discover that I really was a Greek goddess. You mean it's in the strings? he asks incredulously. 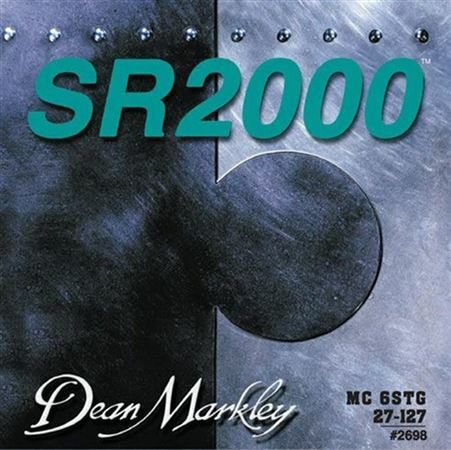 Dean Markley SR2000. Big sound without the big price. I've tried a lot of different strings for my 6 string Ibanez and none have worked as well as these. These strings feel nice they have a great slap tone and I love the gauges. No wonder "Thundercat" swear by's them for recording. There good strings. At one time endorsed by Will Lee, bassist. I like this strings for its clarity, and Slapping ability. There good string for active basses.